Perfect for a Caribbean holiday, Cuba has some of the best beaches in the world, the most fascinating history and is legendary in its own right. Communist Cuba is changing politically and this is a great time to witness the revolution and speak to locals about life here… how it has been and how it will be. Drink rum, smoke cigars, take pictures of Che Guevara imagery and take a tour around Havana in an Old American car. Being one of the most reasonably priced of the Caribbean islands… there really is nowhere on earth quite like Cuba and the time to go is now. Cuba’s capital city, Havana, is charm personified…from the amazing colonial architecture to the classic American cars lining the streets. A designated UNESCO World Heritage Site, Havana is passionate, eclectic and makes you feel like a 50′s icon! Visit the Catedral de San Cristobal in beautiful Old Havana or go for a tour at the Havana Club Rum Factory! Strung along Cuba’s North coast, The Cayos are a set of unbelievably perfect islands… made for romance, relaxation, honeymoons and a dose of that Robinson Crusoe vibe. Cayo Santa Maria is luxury resort central where you can wander through mangrove forests or sleep on white sand beaches. If it’s an underwater adventure you are after… Head to Cayo Coco, for diving in one of the world’s largest coral reefs. If the Cayo’s are too laid back for you try Varadero or the Holguin Region for something a bit busier but with fantastic beaches. Flying time from UK: 9 hours Currency: Peso Average Temperature: During the winter 15Cº and during the summer 37Cº (77Fº). Sunny Days a Year: +200 days. Top tip: Why not get a driver to take you on the 8km Malecon sea-drive, which runs along the city from Havana Vieja. You will get a true taste of Cuban life driving along this section of road! This newly beautiful renovated Hotel located in Santa Clara is in the heart of Silicon Valley, minutes from Paramount's Great America, the Winchester Mystery House, Santa Clara Convention Center, Santa Clara University, Stanford University, Santa Clara.. Situated in the heart of Silicon Valley, the popular hotel Best Western Inn Santa Clara is located on the historic road El Camino Real. Some of the world's largest companies including Google, Facebook, Yahoo, eBay, Apple or Oracle can be found in the..
Great beach hotel that perfectly harmonizes with an impressive environment of white and fine sand. Exclusive paradise for relaxation, weddings and honeymoons. Location It is 140 km to the east of Havana, located on the Hicacos peninsula, a strip of land.. Simple and comfortable hotel to enjoy a combination of sea and nature. Perfect choice for families and scuba diving enthusiasts. Location Club Ancón, located on the beach of the same name, puts guests in a uniquely beautiful spot, very close to the.. Excellent beach complex in a beautiful environment of sun and warm transparent waters. The ideal place for family holidays and a group of friends. Location A friendly resort positioned just a few steps from the beautiful Guardalavaca beach, this hotel.. Comfortable accommodation in a beach of warm and clear waters with amazing corals. Ideal place for relaxation, ecoturism and sea lovers. Location Club Costa Sur, located on the beach of the same name, puts guests in a uniquely beautiful spot, very close.. This splendid hotel is located directly beside the Marea del Portillo beach in the province of Granma. This all inclusive hotel complex with Cuban character elements features a garden and a terrace. The hotel welcomes guests at the lobby with a reception.. This attractive beachfront resort is surrounded by palm trees and sandy beaches, offering Cuban flair and beautiful sea views. The fantastic beach is protected by the longest continuous coral reef in Cuba, making this an excellent base for snorkelers.. 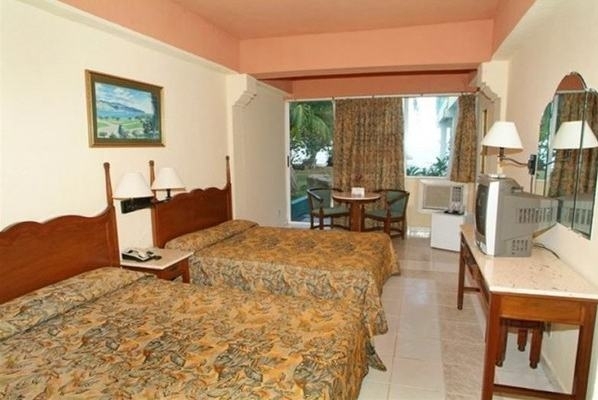 This all-inclusive hotel lies directly beside Rancho Luna Beach, which, with its fine sands and enchanting underwater world and coral reefs, is ideal for diving.||The hotel offers a Cuban ambience and comprises a total of 222 rooms of which 3 are suites,.. The complex is All Inclusive and has a Cuban character; there is a garden and terrace. There is a main 4 floor building and a 2 floor annex, with a total of 283 rooms; 140 Tropical's, 56 Bungalows, 13 Cabins and 4 Junior Suites. There is a 24 hour reception..